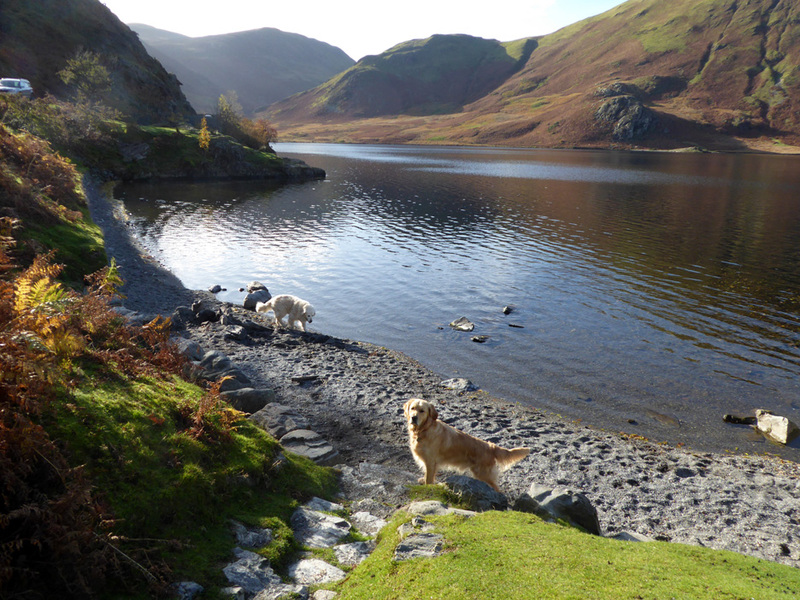 " Rannerdale and a Duck ! " Date & start time: Wednesday 2nd November 2016, 12.45 pm start. 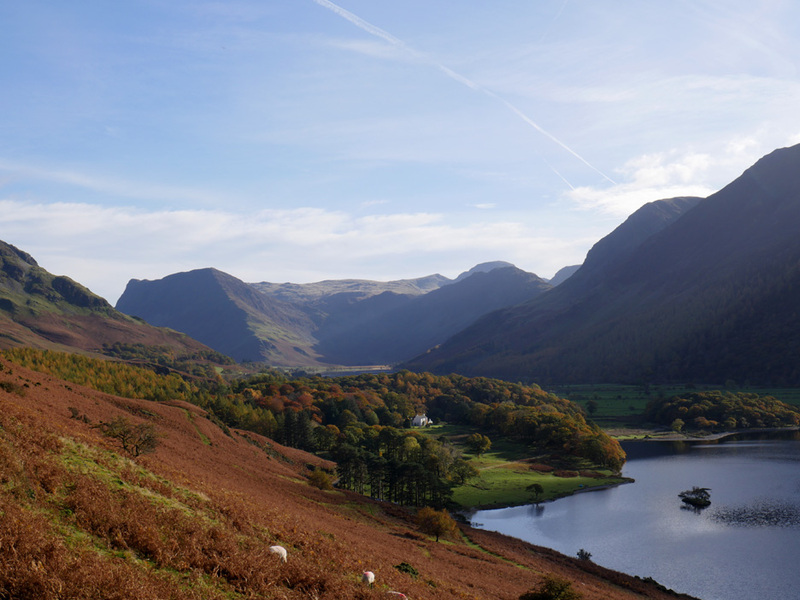 Places visited : Hause Point, Rannerdale Knotts, Low Bank, Rannerdale Valley. 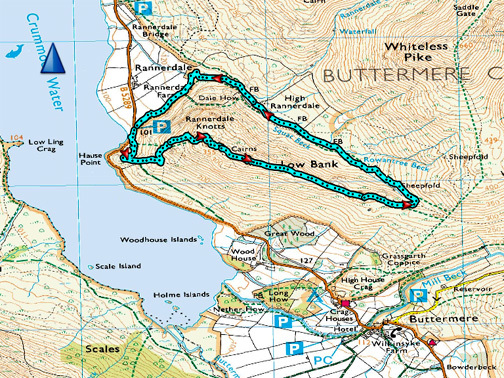 Walk details : 3 mls, 1125 feet of ascent, 3 hour 5 mins. 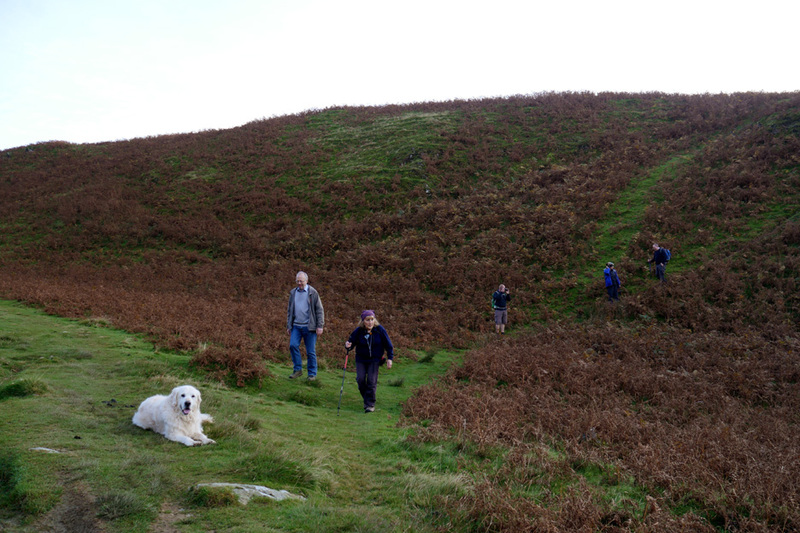 Walked with : Mark and Gill, Ian and Mike, Ann and our dogs, Harry and Dylan. Weather : Sunny, autumnal weather, cooler in the shadows. 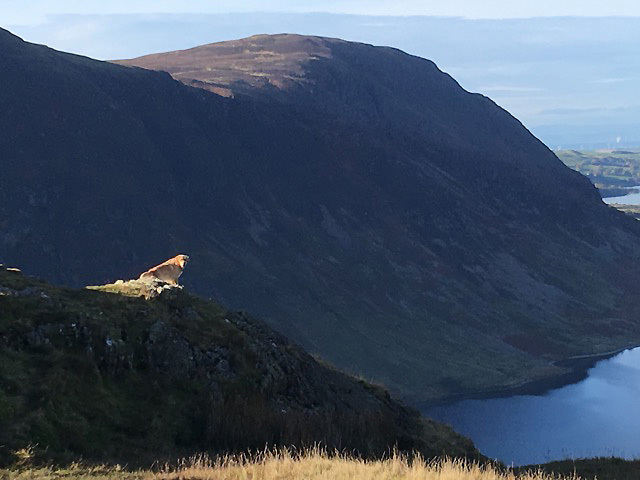 On a previous walk this year we met up with a Panda but now a more feathered friend graces the summit of our fell today. 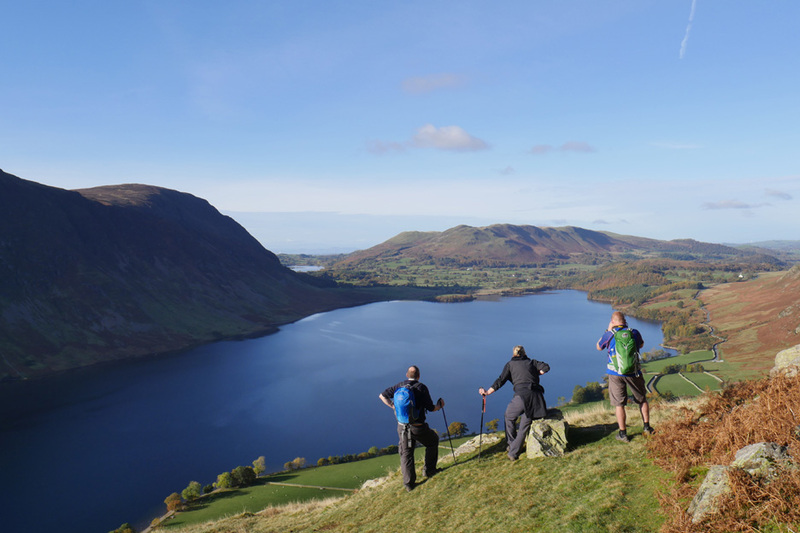 Mark completed his Wainwrights a while back but now it is Gill's turn to try. 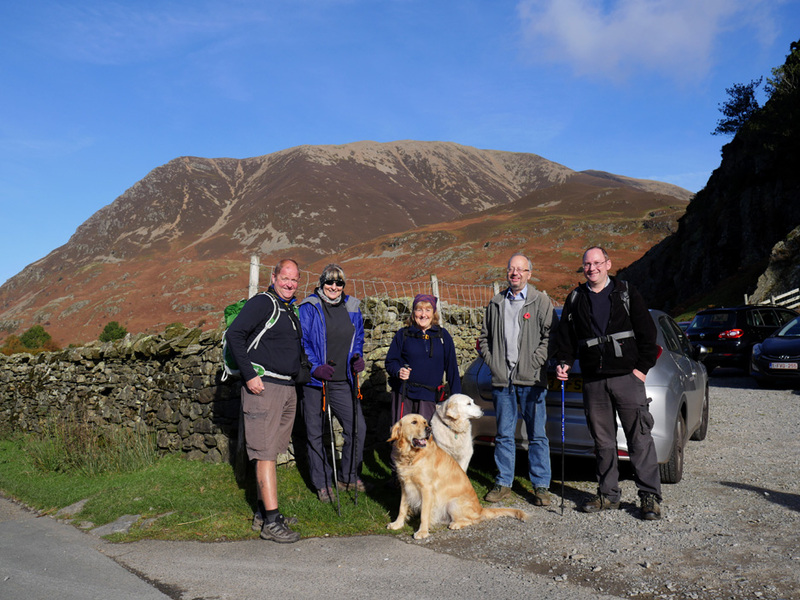 Ian and Mike join in as we head up towards Buttermere for the walk. Group photo to start . . .
Mark and Gill, Ann, Mike and his brother Ian . . . plus hounds. 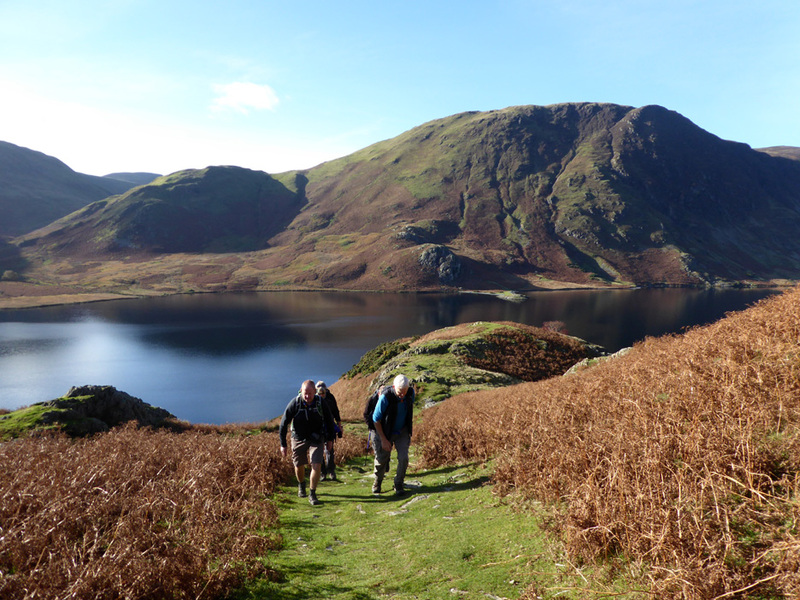 We will be walking up the front of Rannerdale so start along the road for a hundred yards or so. 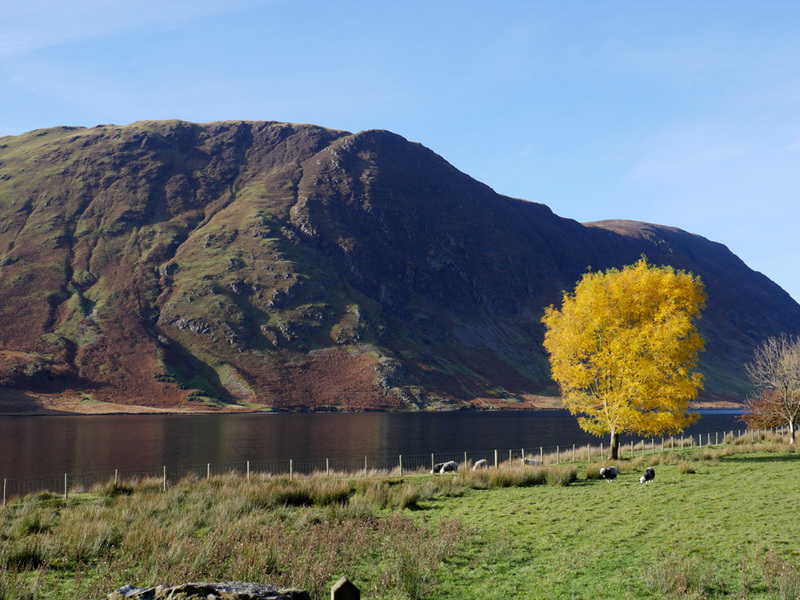 Across the wall is a rather nice colourful autumnal tree, contrasting nicely against the shaded slopes of Mellbreak. The old ash was toppled by the winds a few years ago and now appears to be re-sprouting. Don't be fooled however . . . that's a red-berried hawthorn alongside, the ash has now become a transfixed sculpture of nature. Nothing fixed about these two as they, or should I say Dylan, dashes up and down the small beach. Looking down on the ash, the hawthorn, the yellow tree and the cars far below now. The rowan has lost its leaves but retained its heavy load of berries at the end of the season. The next stage of the route as we now climb above the hause on a sloping green path. 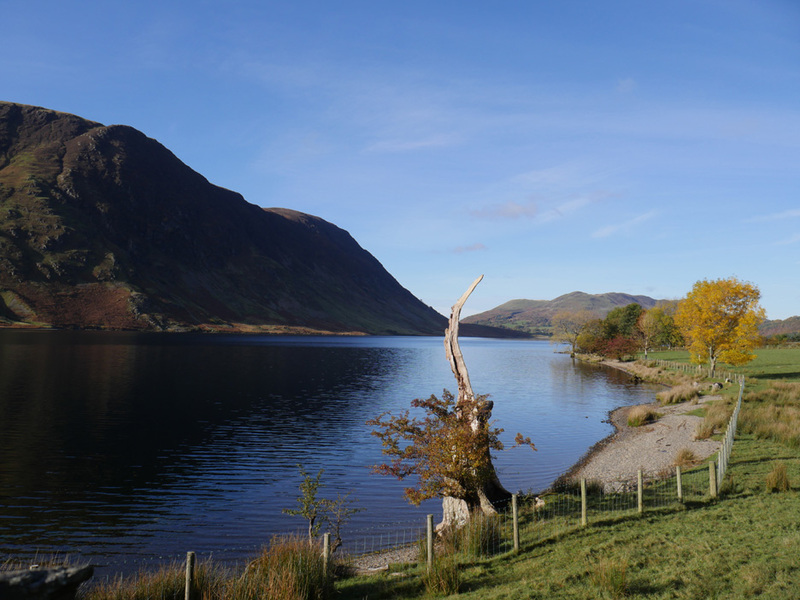 There are several folk and a canoe on Low Ling Crag beach on the opposite side of the lake. Two more canoes were paddling around mid-lake and out of picture. 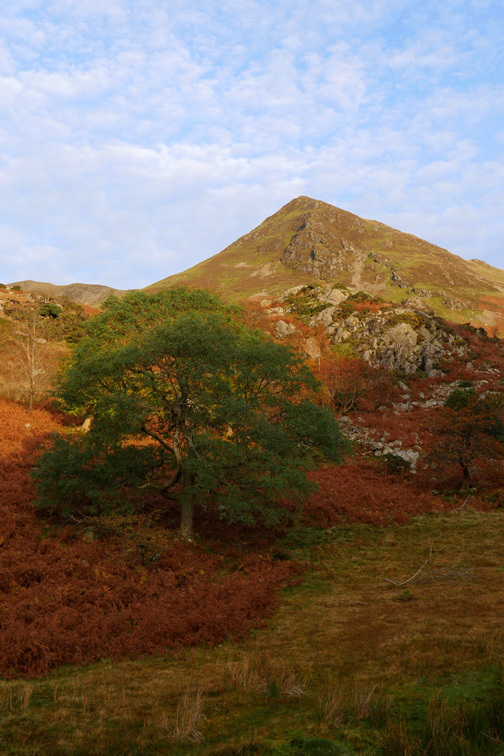 The wider view including the minor summit of Scale Knott on the southern end of Mellbreak. 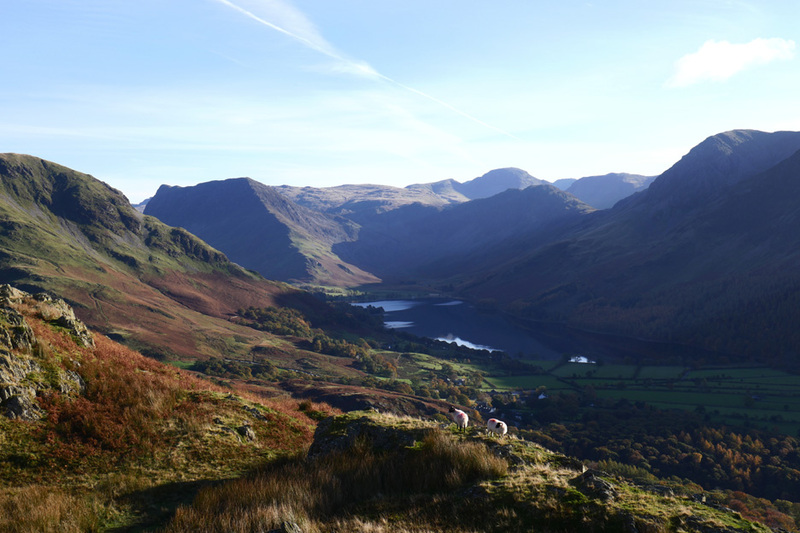 A pause for breath and a chance of a photo up the valley from the top of the next rocky crag up the path. Zooming in on Wood House. Lifting thine eyes to the hills . 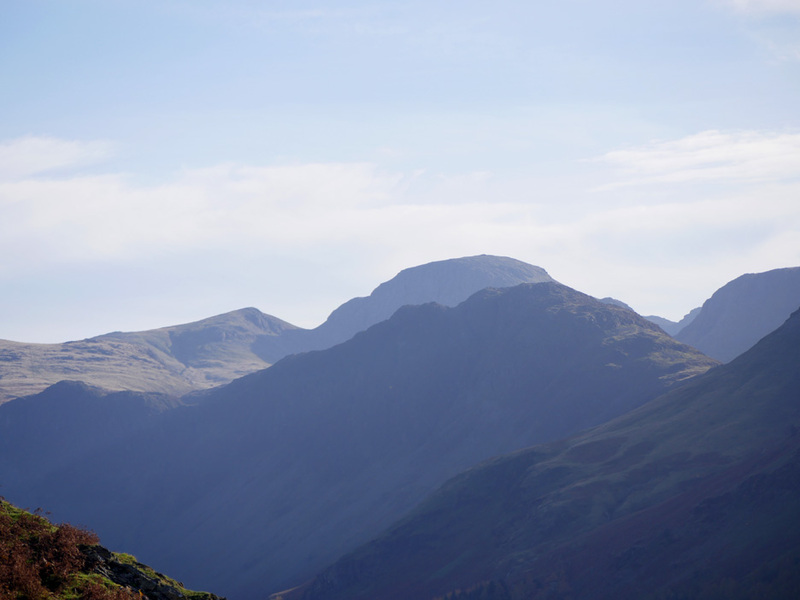 . . Haystacks with Green and Great Gable behind. Through the gap . 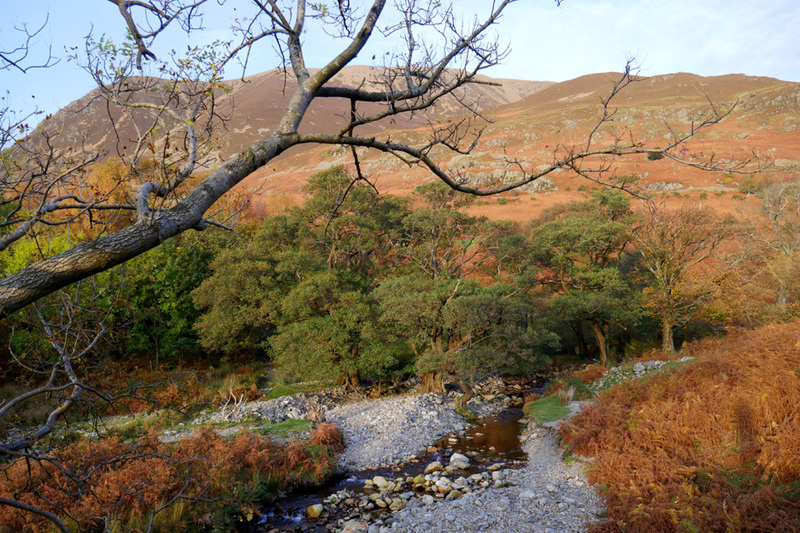 . . part of the Scafell range at the head of Wasdale, two valleys over. and became a reluctant star for a short while. the summits she needs to complete her round. 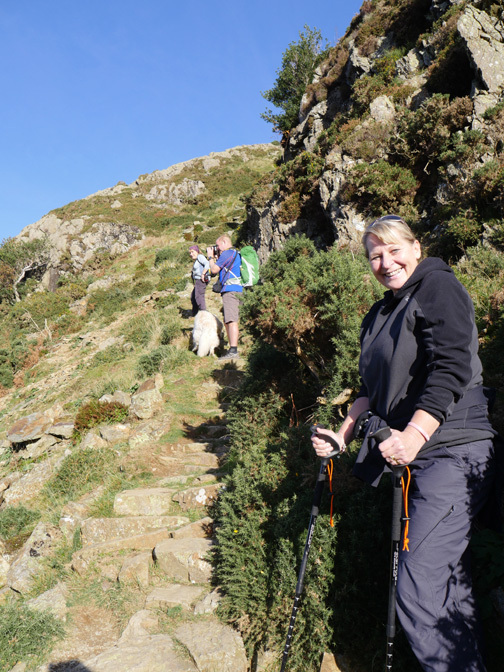 The steepest part of this walk has been pitched with stone steps which makes ascent easier and erosion less. Careful if you are walking up here in the cold as the water tends to ice up the middle set of steps ! There seems to be a good view today . 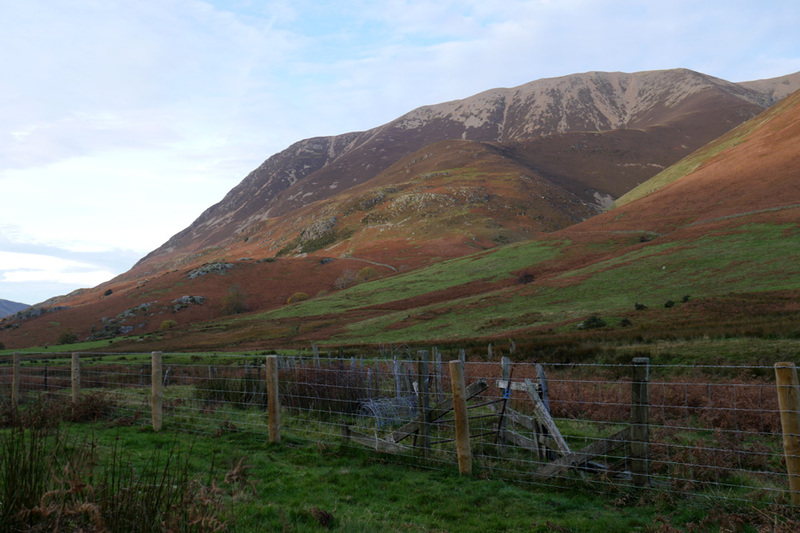 . . and it is not just the long distance one to Low Fell and the distant Solway. 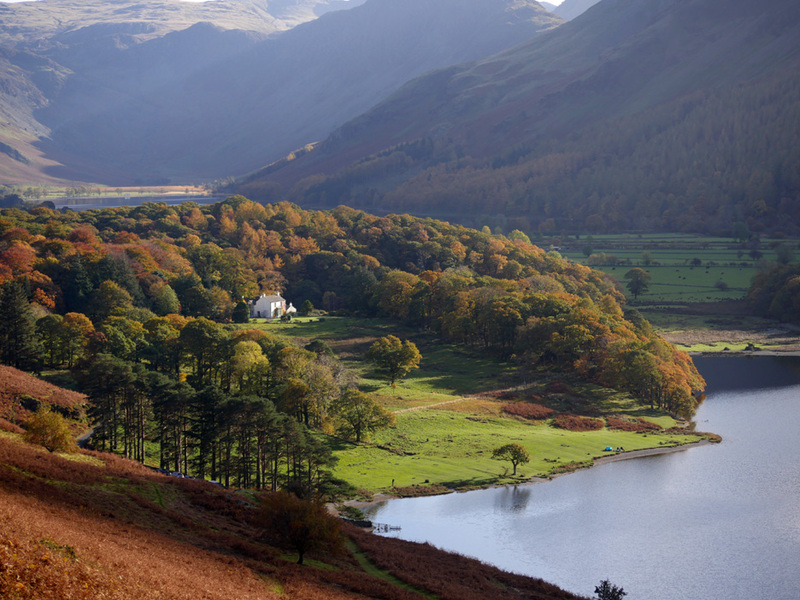 The view down to Rannerdale Farm is bright and clear as if it were a model just sitting on a table top in front of you. 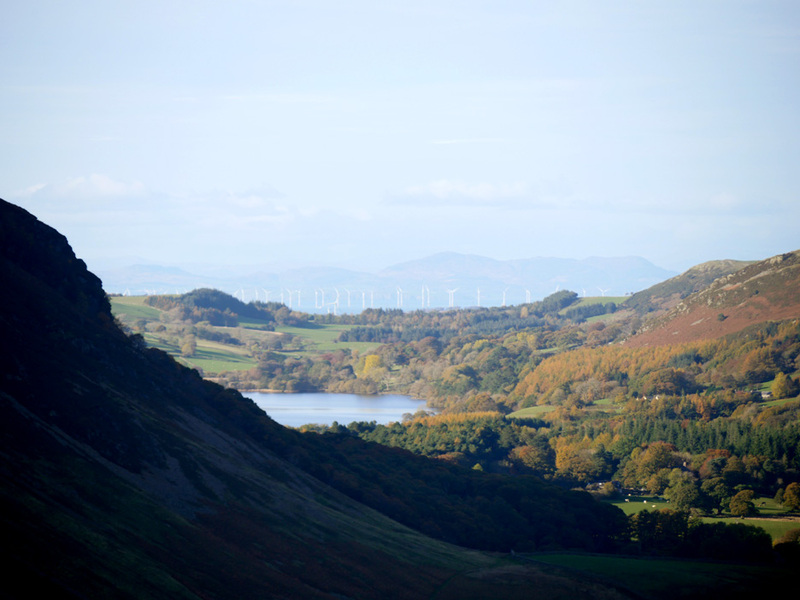 as we look through the Loweswater gap to the north and to the distant Scottish coast. 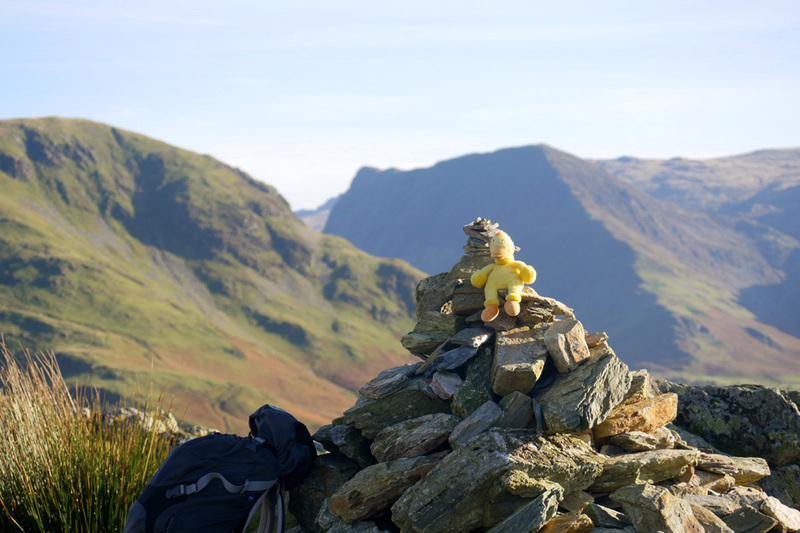 and we are on the summit of Rannerdale Knotts . . . Gill points out on the highest bit with her finger. Also on the summit was a duck ! 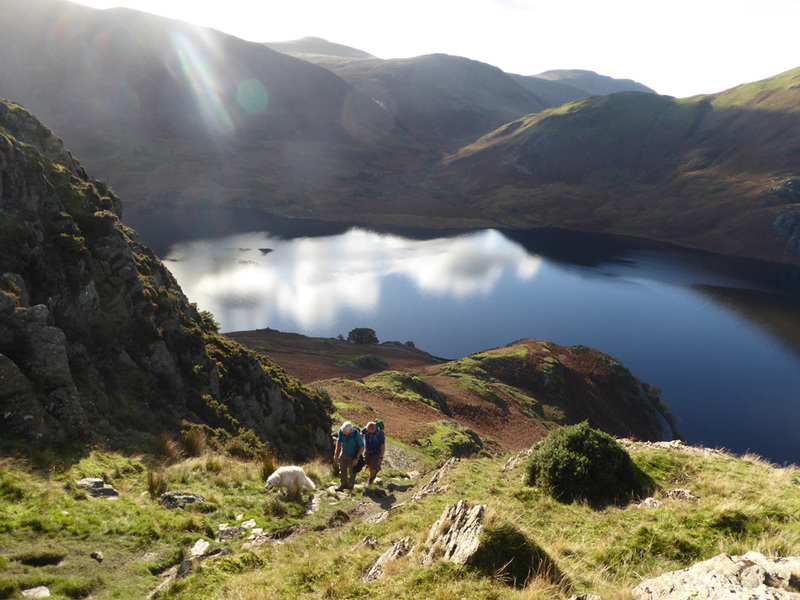 with her German friend (with the red rucksack) climbing Rannerdale and bagging another summit for 'Duck'. 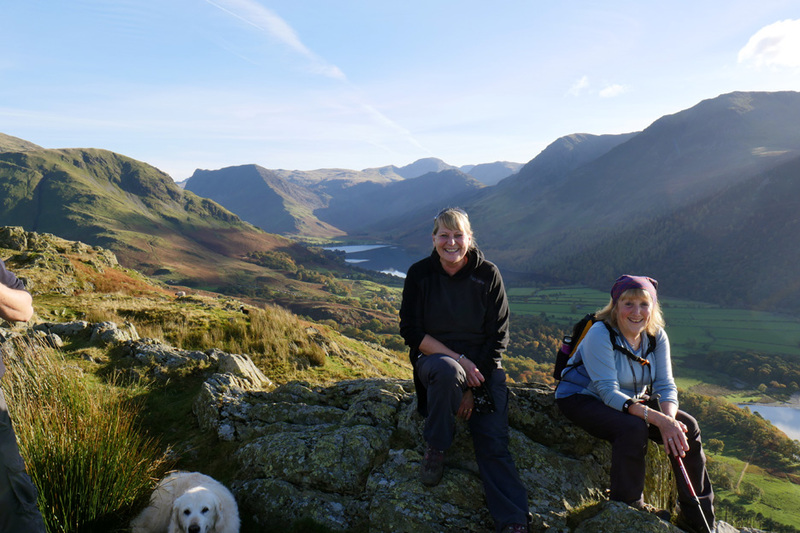 Gill and Ann relax in the summit sunshine . 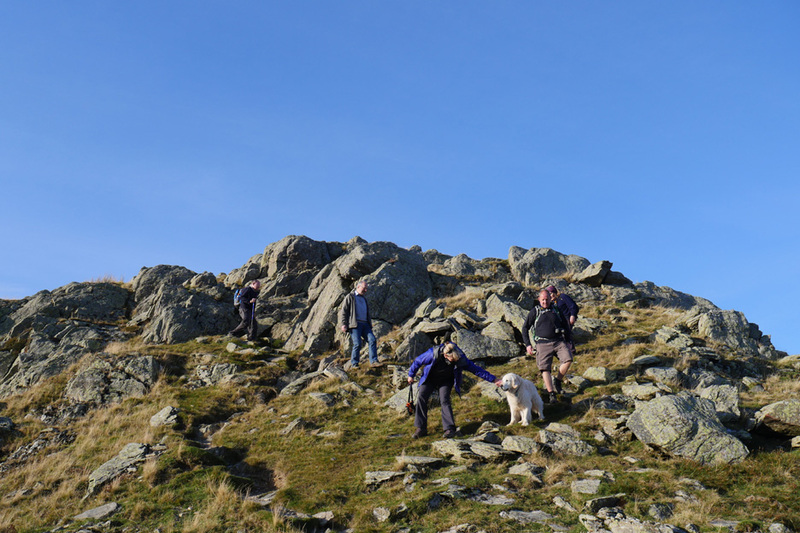 . .
saying that, they could have relaxed anywhere on the way up as it has been a glorious sunny autumnal day. People come . . . stop and chat . . . exchange experiences . . . say hello to the duck . . . and then continue on their way. A picture of Dylan caught in the sunshine . . . sent by Nicky a few days later . . . may thanks. and enjoyed our lunch sitting just below the second summit. 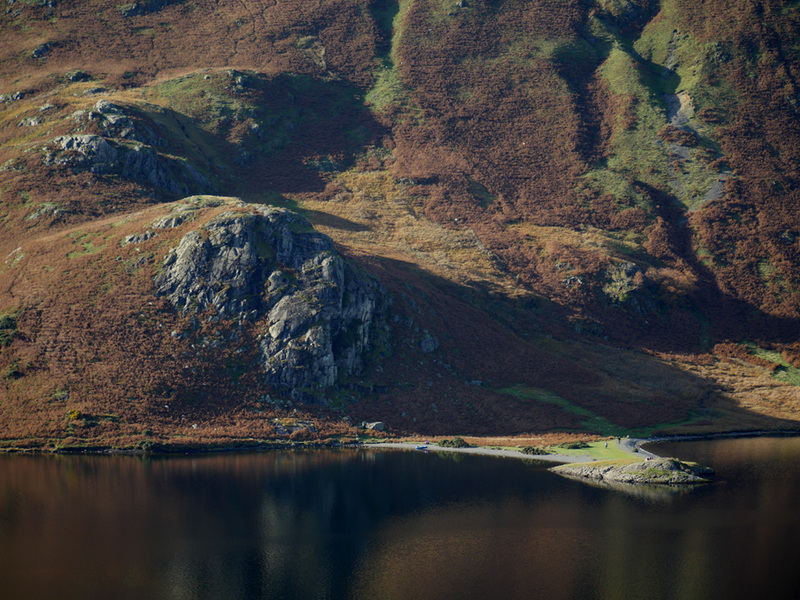 The Rannerdale Rock Step . . . part way along the ridge . 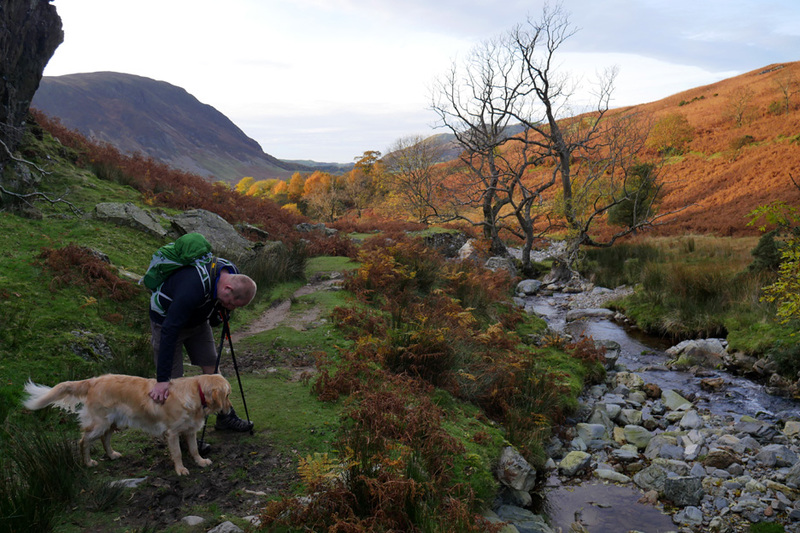 . . as we head towards the Buttermere end of the fell. 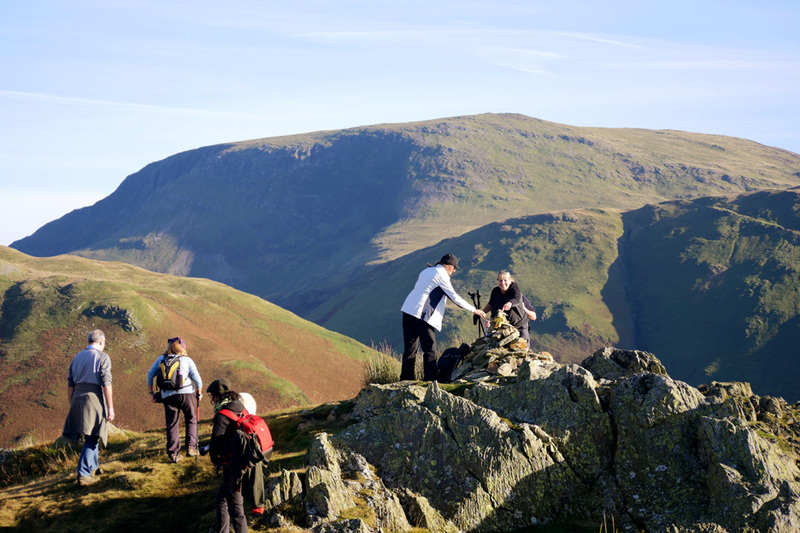 Everyone seemed to take a different line as we negotiated this small rocky descent. 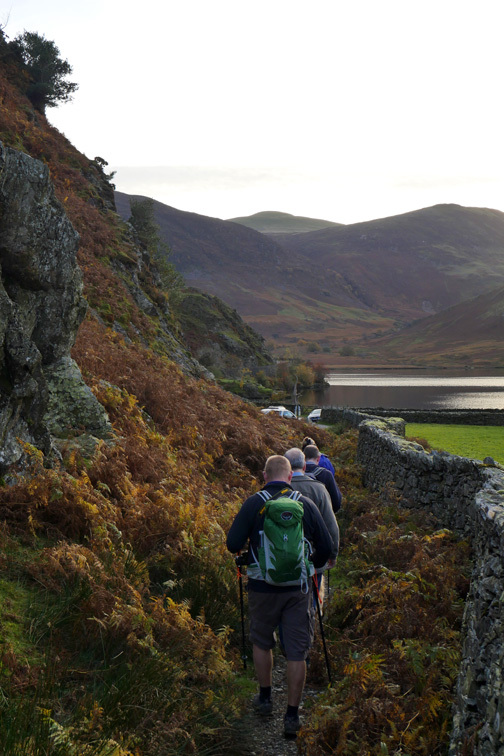 Breaking off the ridge, we headed down into Rannerdale Valley . . . technically at this point it is called the Squat Beck Valley. 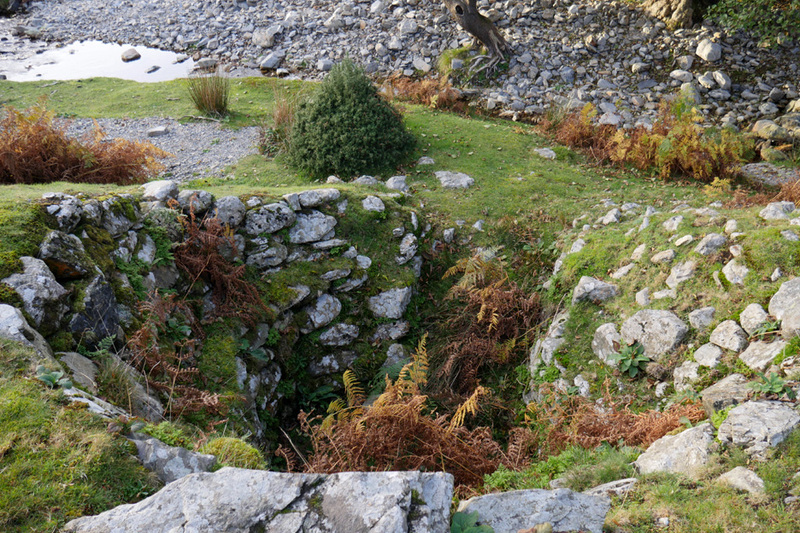 Down past the stone sheepfold and on past the old collapsed wooden one built into a corner in the fencing. 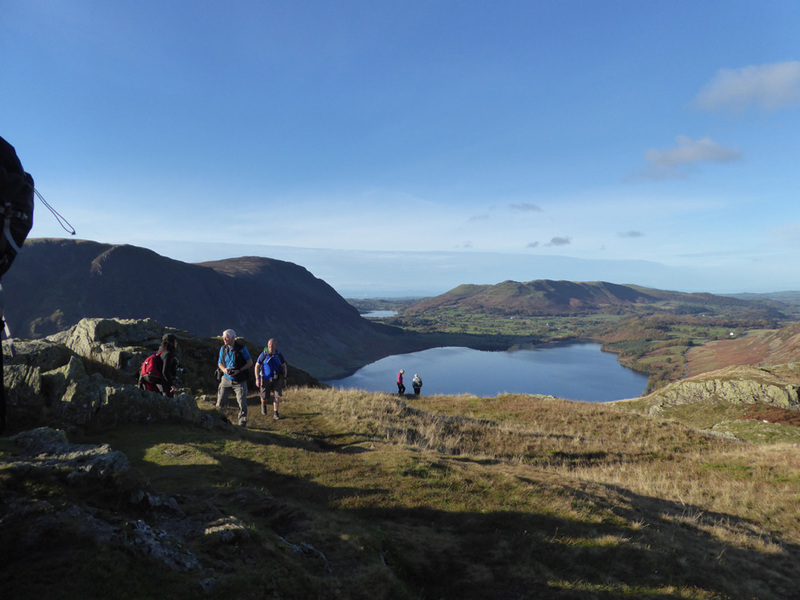 Ahead once again is the bulk of Grasmoor and the brown coloured 'Lad Hows' ascent ridge, the best way to the top ! Into bluebell country now but at this time of year you wouldn't realise it. 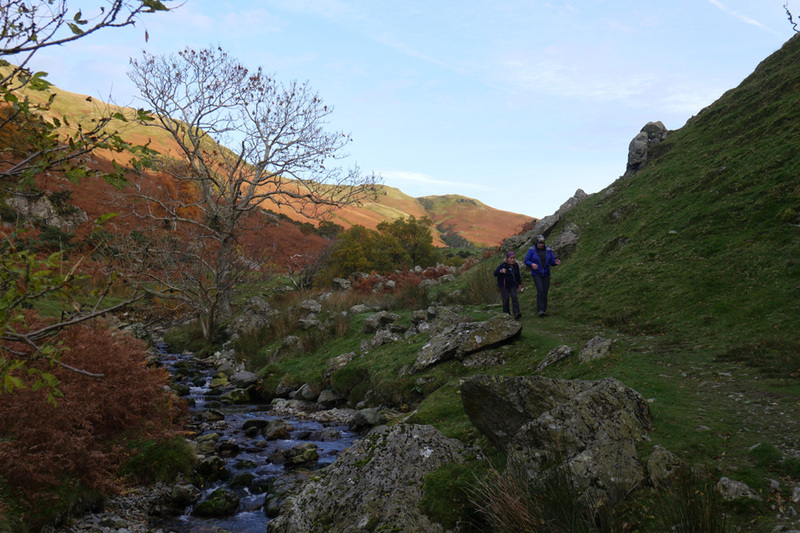 Mark and Dylan in the narrows alongside the Rannerdale Beck. The river looks benign after a dry summer but was a raging torrent in the floods . . . hence all the stones on the banks. To the right, and set up in the grass in front of the last full tree, is what looks like a bank of stone. which when mixed with lanolin, the grease from sheep's wool, made a good basic soap for domestic and farm use. As we walk out we leave Whiteless Pike to oversee the valley . . .
. . . and take the path from the bluebell pasture back to the car. 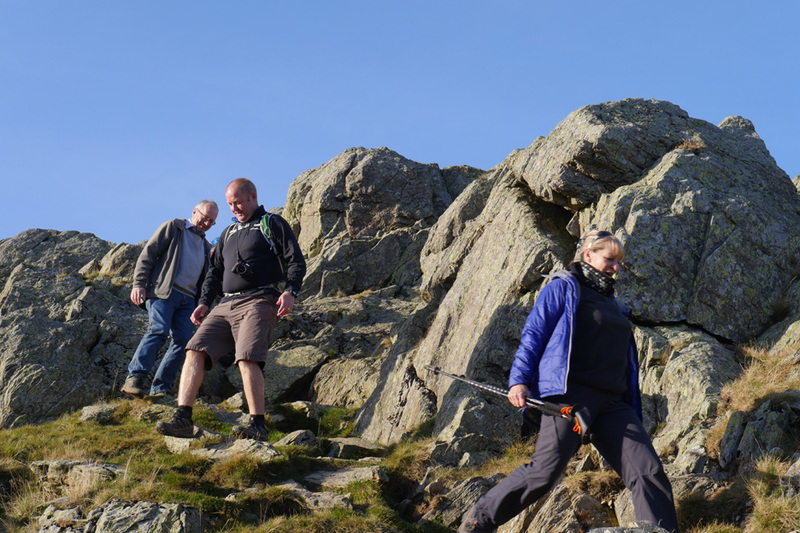 It was cool in the shadows but has been a great day out with friends and a new summit for Gill. A Kirkstile Inn supper beckons for all of us this evening . . .but before that . . . the customary cake and cup of tea at home of course ! Technical note: Pictures taken with either Ann's new Panasonic Lumix TZ60, or my Panasonic Lumix Gx8 Compact System Camera. This site best viewed with . . .a sandwich box with a panoramic view. 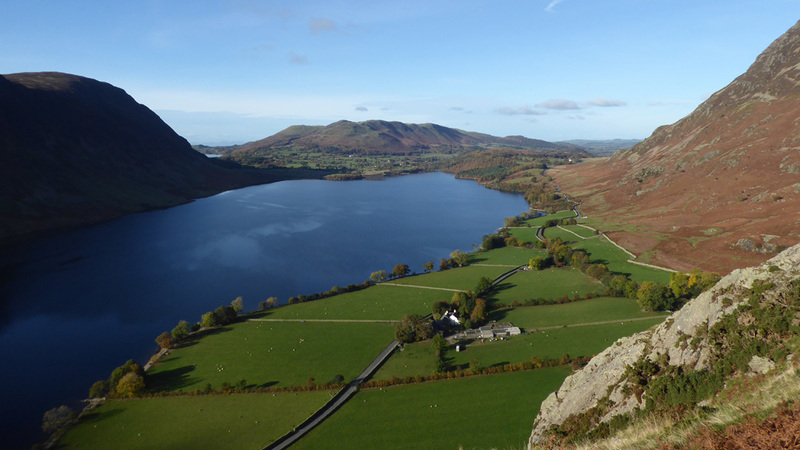 Twelve classic views of the Lake District as featured on Loweswatercam. 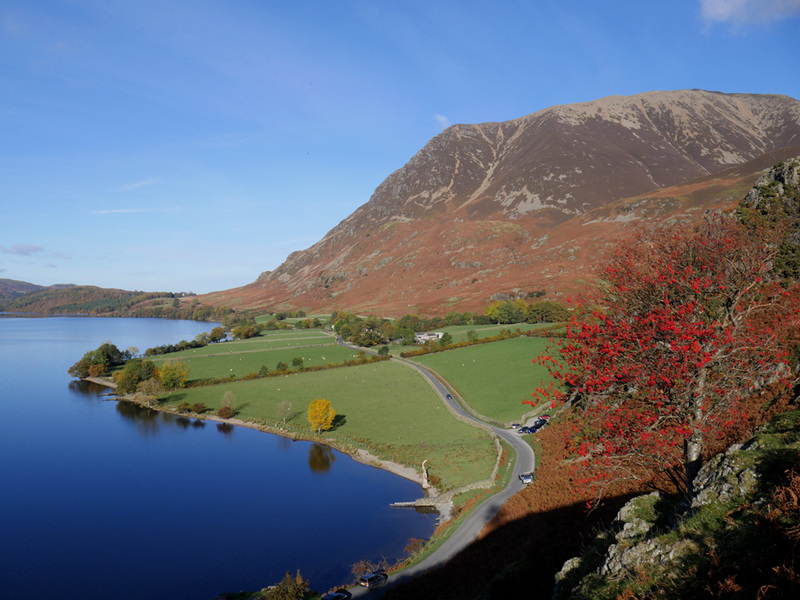 £1 of every calendar sold goes to support the Air Ambulance and local Mountain Rescue.